It's time to see the Pope! 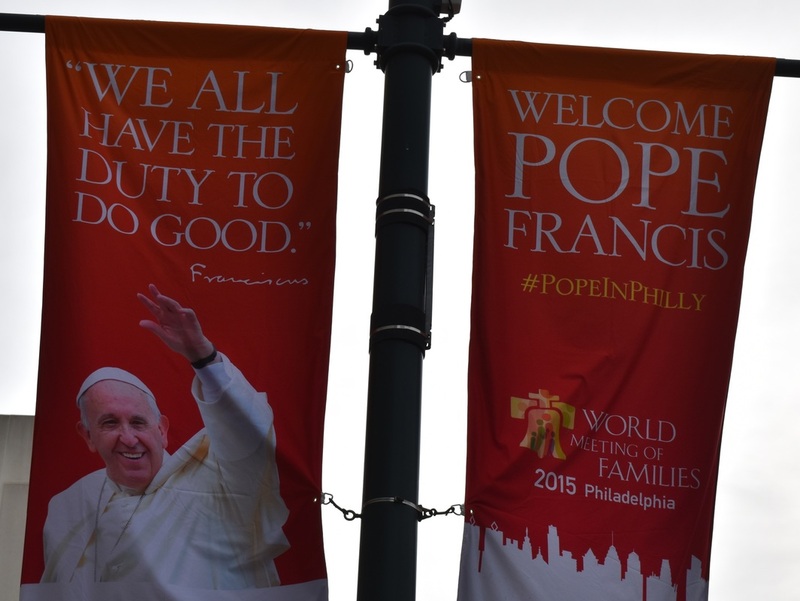 A Pope hasn't visited Philadelphia since 1979 so rather than run from the madness I decided to join. 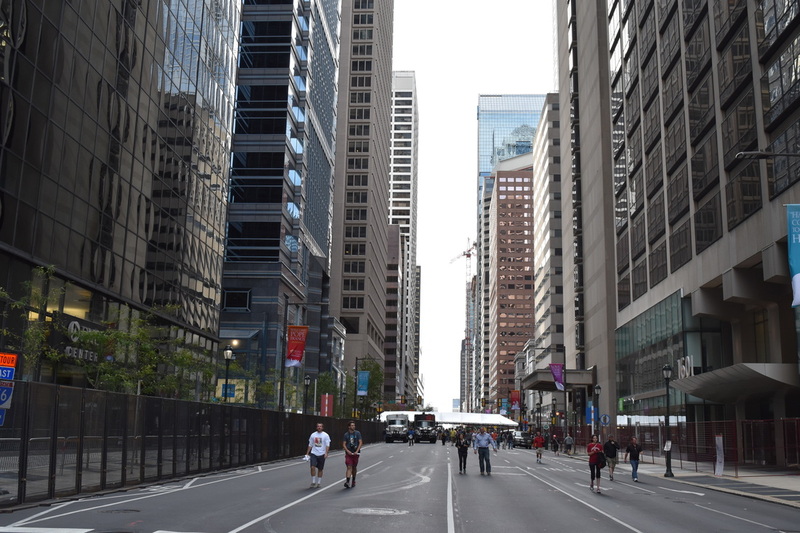 Philadelphia's Center City area was effectively shutdown in a no-vehicle zone and a smaller, tighter security zone. I went to the Warminster Train Station at 6am one morning to purchase my Papal Visit ticket then anxiously awaited the day. On Saturday I arrived at 7:30 at the Warminster Train Station. With an hour to go before the train departure I ate breakfast at Warminster then walked across Street Road. Hardly a person was in sight and I soon boarded the train. From the moment I arrived at Warminster Train Station all participants seemed to be in a joyous and happy mood. 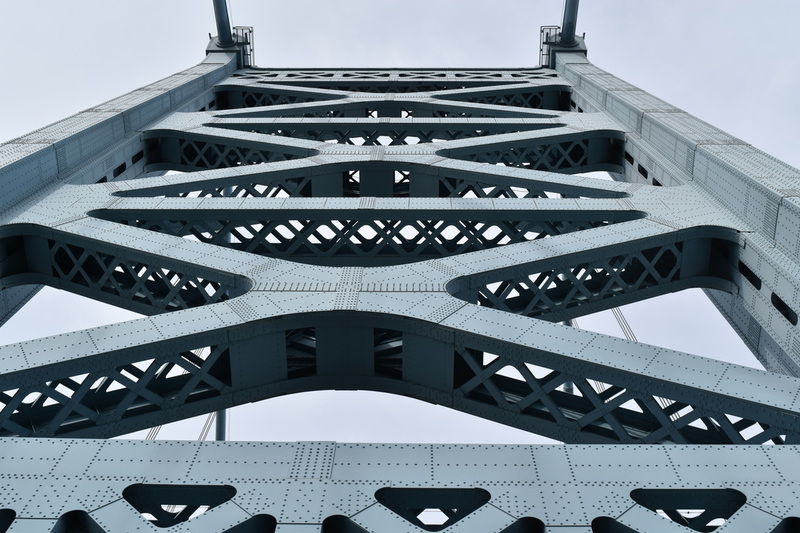 The negativity and doubt typically associated with Philadelphia seemed to have lifted as people orderly filed on to the train and roamed the empty streets. Maybe it was because all the doomsayers stayed away. Maybe it's a fleeting environment. With the Pope's presence it makes one dream bigger and wonder if this mood could be capture for a day, why not a week, why not a year? 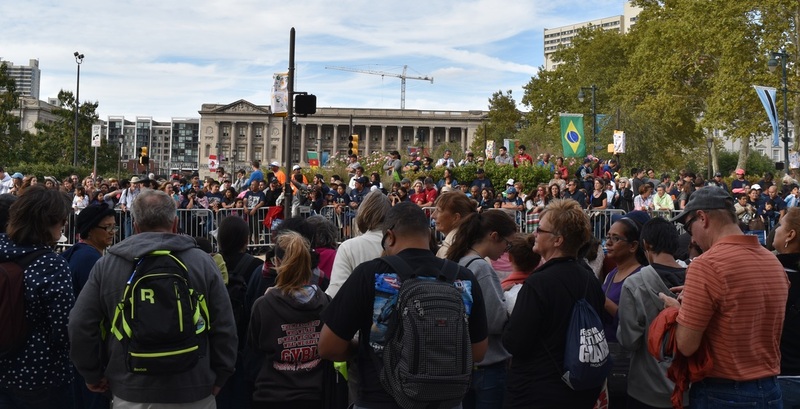 The Papal visit turnout was lower than expectations as it seemed many people either stayed away because they did not want to deal with the security apparatus or higher than normal hotel prices. I considered staying at a hostel until I saw their rates had risen from $30 a night to $180 a night for a bed in an eight-bed dorm. Most businesses stayed open and had standard pricing at their restaurants. 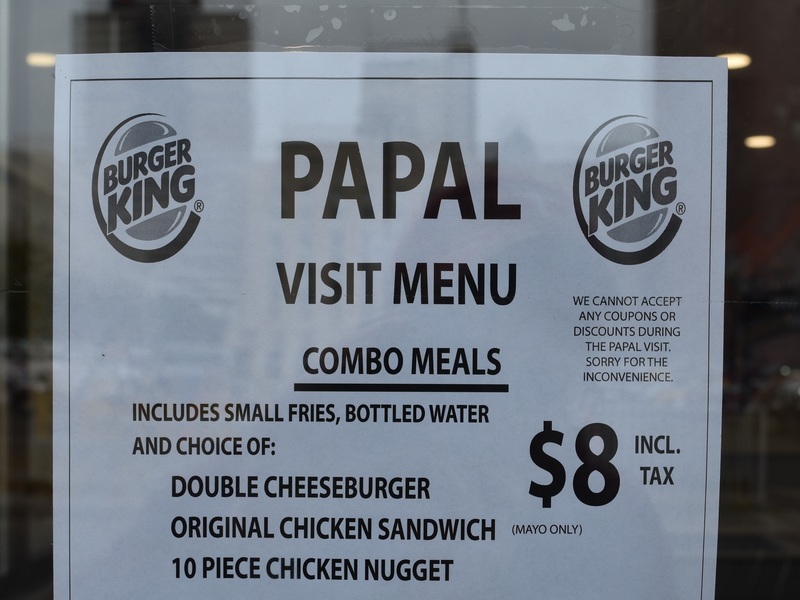 There were a few exceptions: nothing says "We all have the duty to do good" quite like an $8 Burger King Combo Meal. 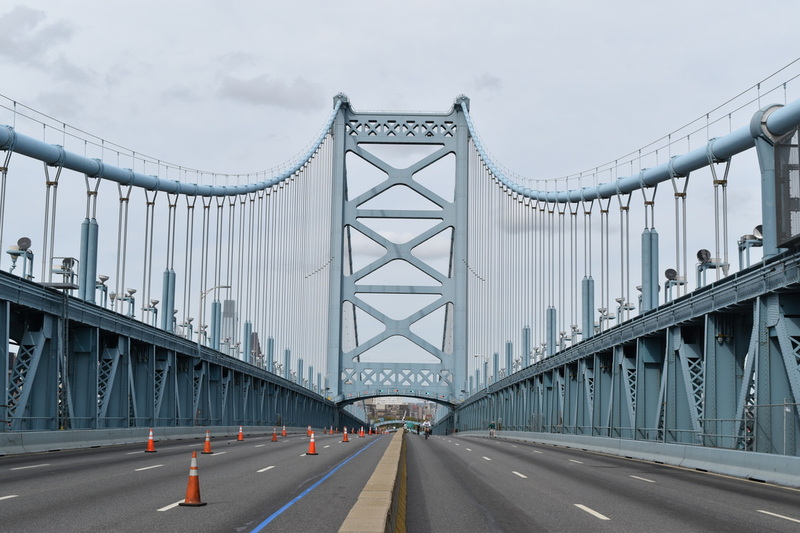 After I arrived in Center City I walked away from the security zone to the Ben Franklin Bridge which was closed except for pedestrian traffic - it was a unique experience to walk across the empty seven lane bridge. 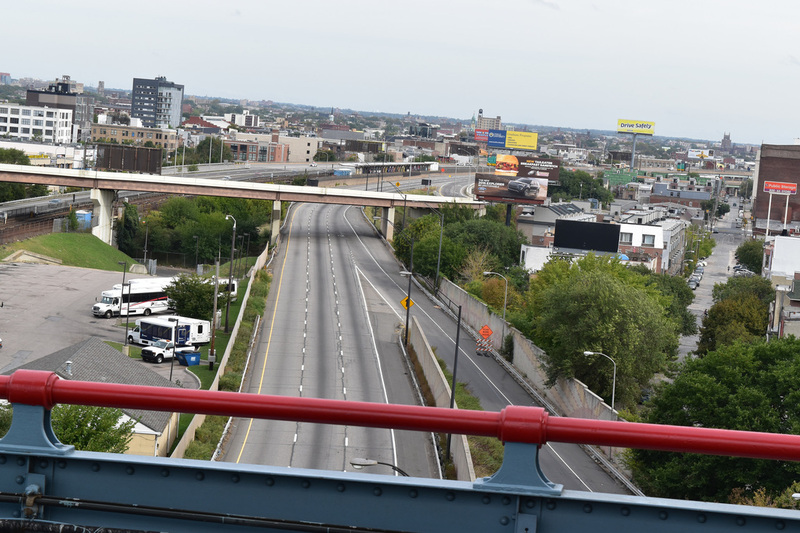 My walk across coincided with the Pope's arrival and drive from the airport to Center City which also temporarily closed I-95. Most visitors came to see the Pope and only the Pope. Instead of walking around the city and taking advantage of the car free streets, visitors went straight into the security zone. They missed out on a once in a forty year street shutdown experience. 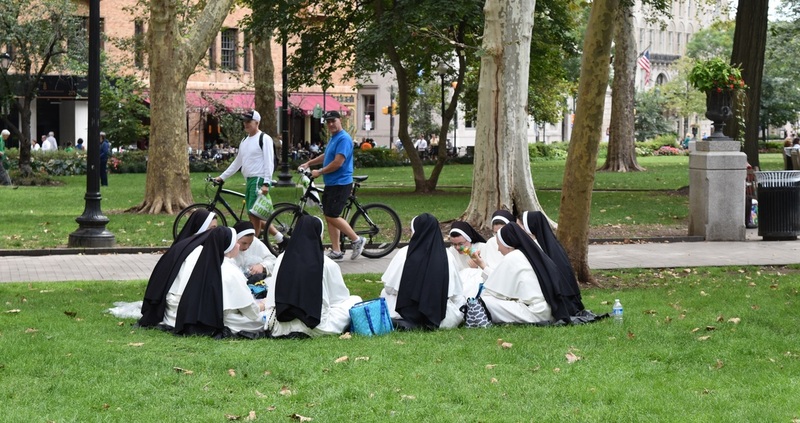 Nuns gathered for lunch in Rittenhouse Square. 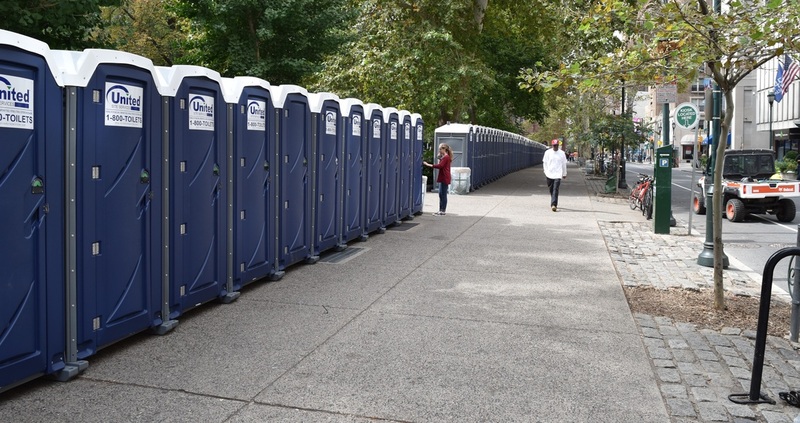 A wall of empty porta-potties lines Walnut Street at Rittenhouse Square. Sadly not many crowds made it south to this part of the city instead heading straight into the security zone from the train and subway. It took about an hour to clear security. There were more security checkpoints on Saturday than Sunday because of the larger security zone. Once in the security zone very few places were open. 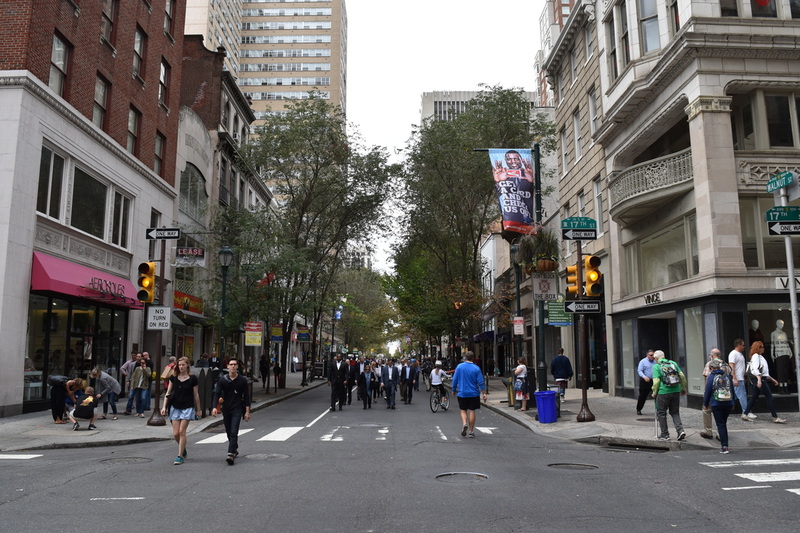 Except for a few bars on the Parkway, which were overfilling with patrons, most businesses were closed. The crowds had started forming earlier in the day and by late afternoon people were about three deep along the Pope's Parade Route. ​The Pope was making a public speech at Independence Hall that was expected to end around five. 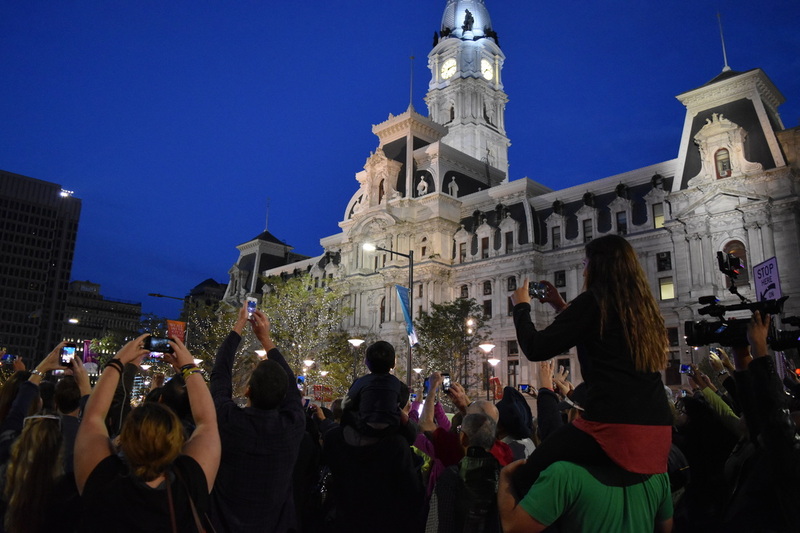 The collectively hope was that after this speech the Pope would make his way to the Ben Franklin Parkway for a parade and wave to his adoring crowd. 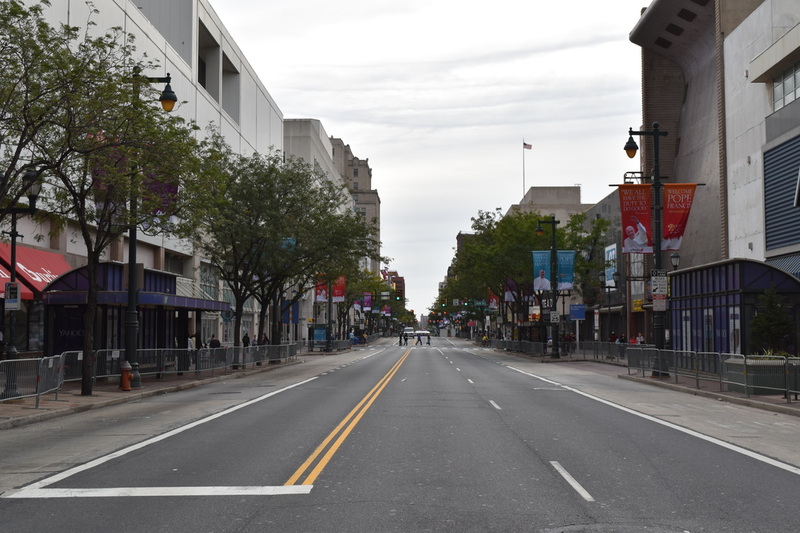 Unfortunately the Pope had other plans and did not arrive at the parade route until after seven. 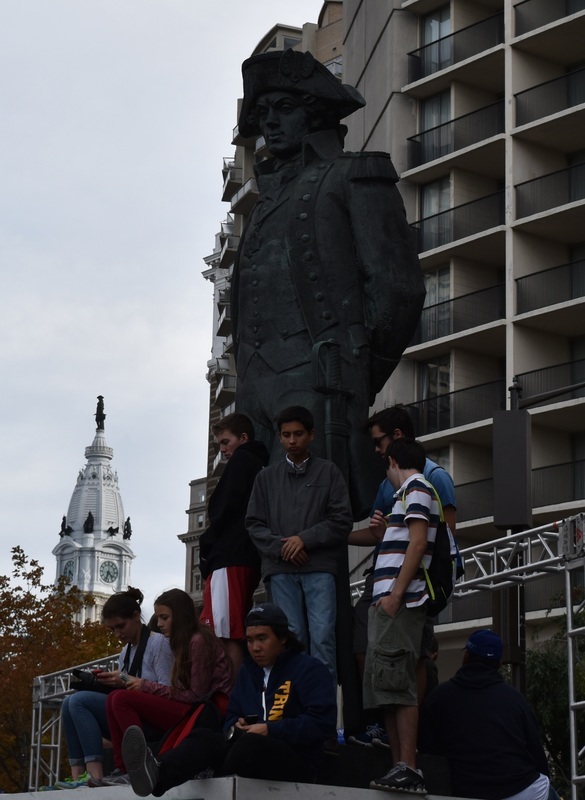 I found a seat on the steps of the Franklin Institute and watched the crowds. A glimpse of the Pope would last for only a few seconds, however, the crowds and the action were the lasting impressions. Rather than jockey for position to take a photo of the Pope I focused on the reactions of the pilgrims. 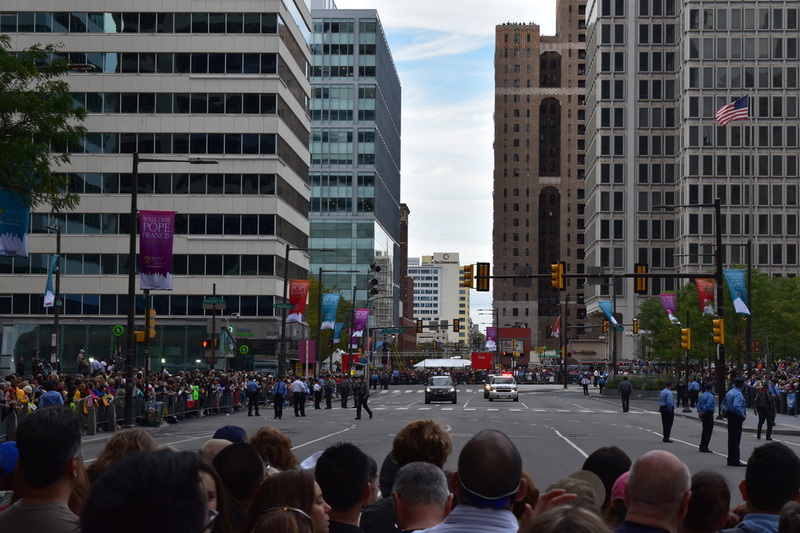 I made my way to the southwest corner of City which had a little more space to move then stood and waited for the Pope to drive by and wave. 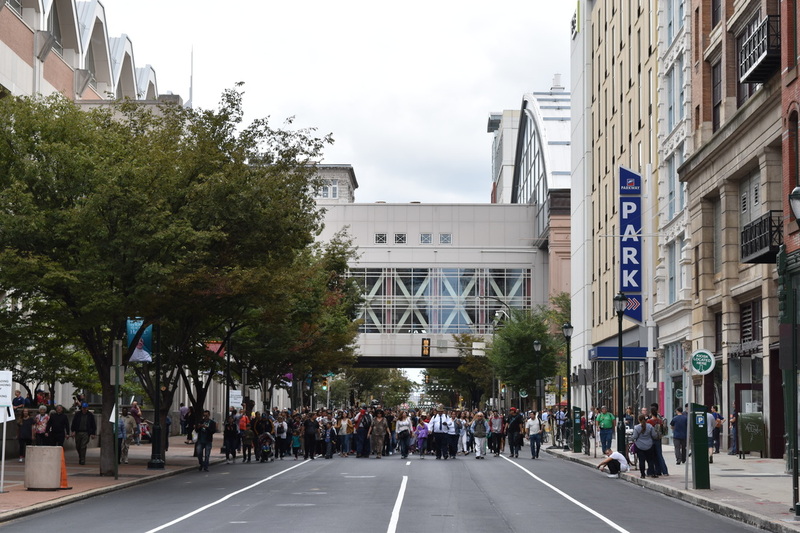 From the southwest corner of City Hall it was easy to exit the parkway and return to Market East / Jefferson Station. I waited for five minutes then boarded an empty train back to Warminster. 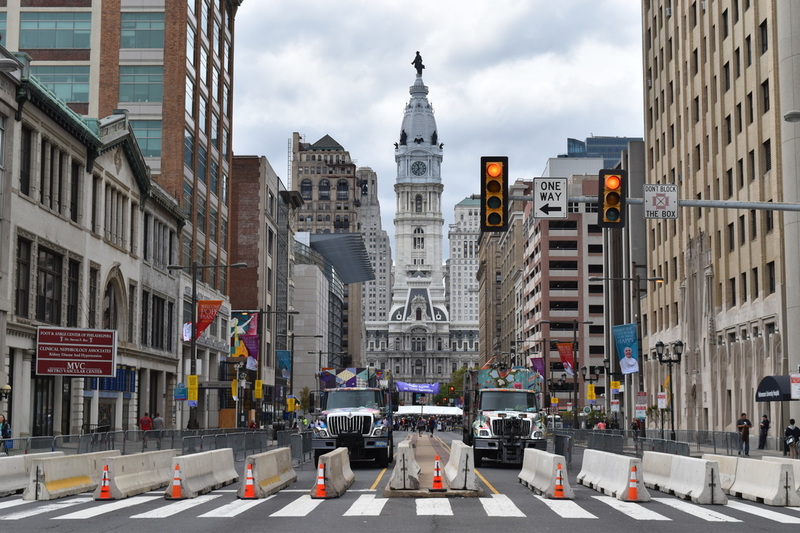 It was a very easy process if you've dealt with SEPTA before and know what to expect when it comes time for the agency to handle a mass wave of ridership.